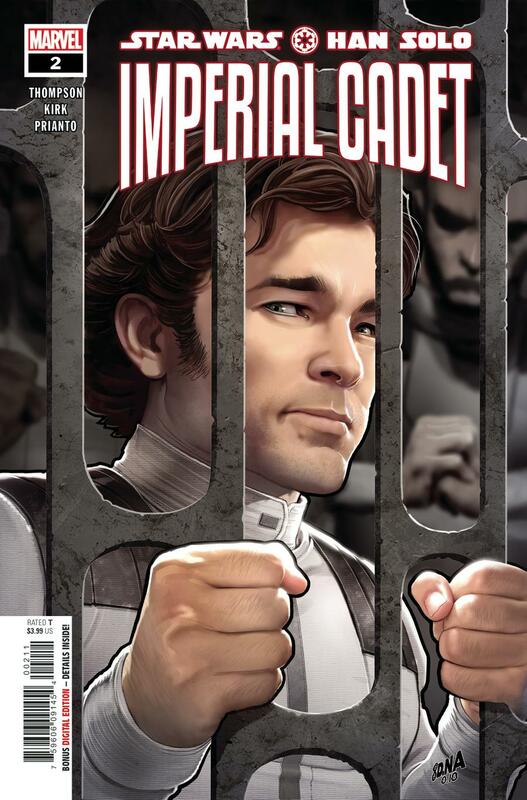 After some turbulence in the first issue, Imperial Cadet #2 is free of the movie retreads that were bogging down the story and can now create a more complete, better-paced episode from Han’s academy days. Despite this, the story does very little with its newfound freedom. It’s content to quickly resolve last week’s cliffhanger, pass some time, and get Han back in a cockpit by the final few panels. I had been hoping that the more comfortable pacing would also eliminate the hasty, ill-formed plans and explanations of the first issue. It doesn’t. Han is uncharacteristically, annoyingly stupid in these comics. There’s a flat-out misunderstanding of the character and his archetype as a whole. Han’s traits — from his humor and bravado to his eagerness to fight — are all underlined by a survival instinct. That survival instinct should outweigh his rashness, especially at this phase in his life. So when Han narrowly escapes execution with a warning that another toe out of line will mean death… why would it be that the very next thing he does is throw a punch at a bullying cadet? The Empire is equally mischaracterized and it manages to contradict itself in ways that only writing of this caliber could allow. The Empire is as ruthless as it has ever been in this series. They view their (volunteer) cadets as property and tell them as much. The lives of cadets are worth less to the Empire than the ships that they fly. However, Han destroyed a handful of TIEs in the last issue and he is not executed in this issue because an officer takes a fatherly shine to him. The art, at least, has improved a bit with more reliance on the softer, sketched style than the plasticky sheen used in the majority of the first issue. It’s well-suited to the swirling TIE fighters and sweeping dust clouds they create, but faces are still inconsistent. Often swollen and puffy, it can be hard to recognize secondary characters from one panel to the next as they can undergo such drastic changes in facial features. Much like Han’s time in the Imperial Academy, this comic only succeeds when it takes to the air. The rest seems to bide its time with Han until it can put him back in a ship. Unfortunately, the filler is so bad I’ve lost any optimism I had for this series. Han is an unlikeable idiot who bears no resemblance to the character you know — by face or personality.